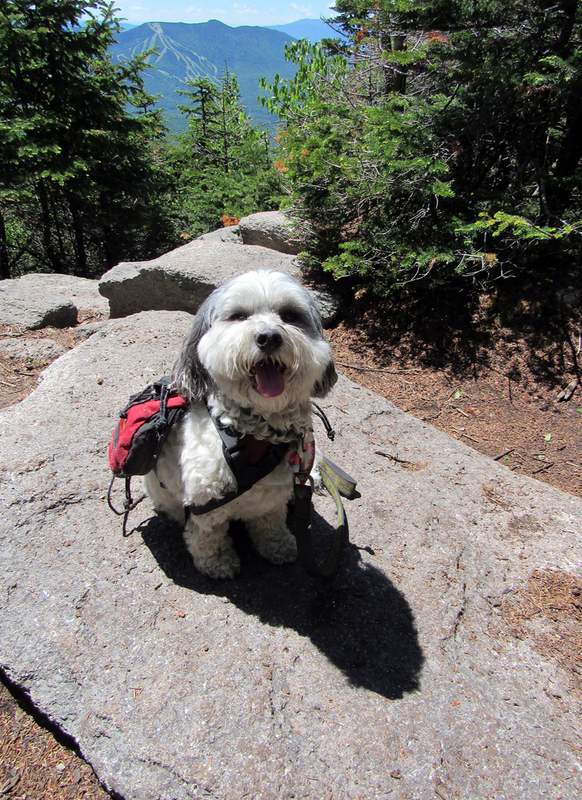 This was only our second trip of the year and Patches' 27th and 28th 4000-Footers. I was still a bit out of shape and/or suffering from side effects of taking Prednisone, so I was still struggling to climb without stopping regularly to catch my breath, although I think I did slightly better than on our last trip to Passaconaway. 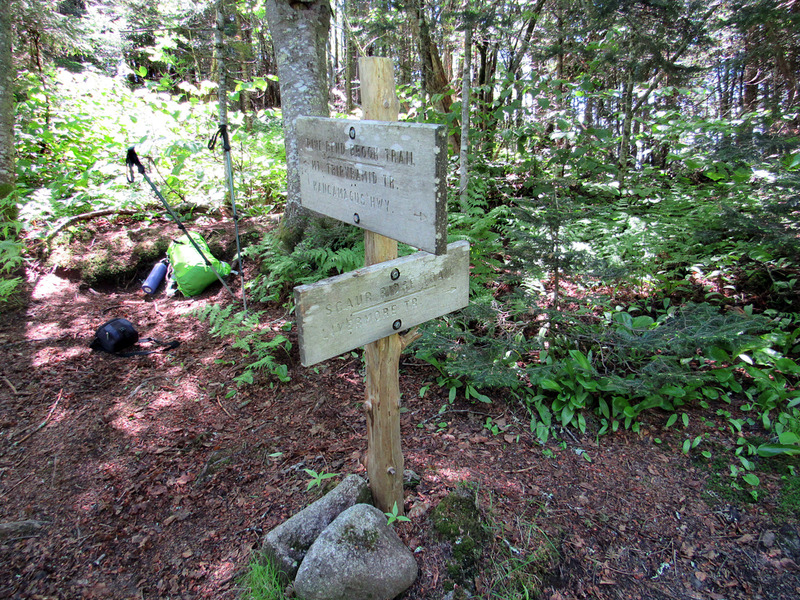 And, of course, we did make it up two peaks (three if you count having to climb North Tripyramid a second time on the way back)..
As usual, we left home at 4:30 AM to make the drive to the Pine Bend Brook Trailhead along the Kancamagus Highway east of Lincoln. The forecast had originally been for a nice sunny day, but was changed the night before to rain, ending by 8 AM and gradually clearing. When we passed through Lincoln, it was still gloomy and drizzly and I considered either waiting an hour or so, or just abandoning the hike altogether because of slippery rocks in the steep sections. We continued on, however, and by the time we got to the trailhead, it was still gloomy but at least it had stopped raining. I decided that we should give it a try. After all, it might actually clear up like they said it would. Amazingly, by the time we passed the border into the Sandwich Range Wilderness, the sky was looking a little bit lighter. 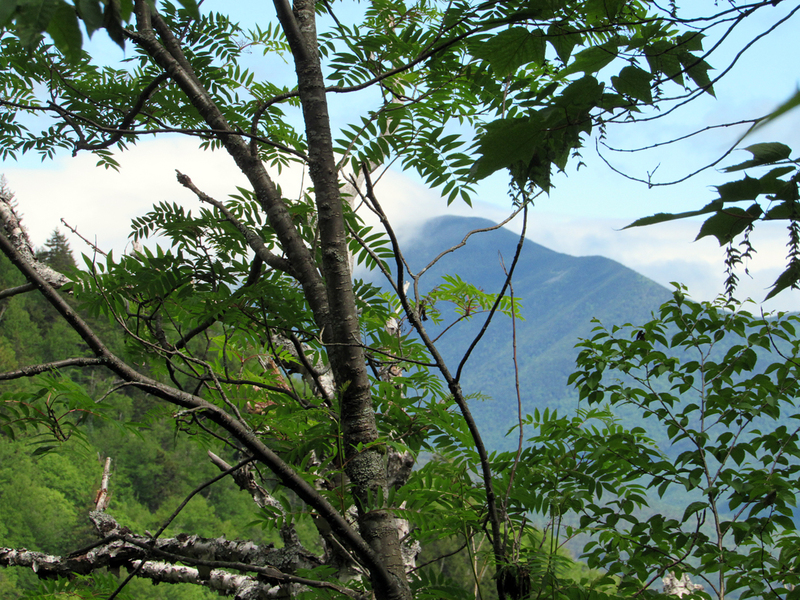 And when we made it to the steeper sections where the trail crossed over to the other side of the ravine, we were finally able to get a glimpse back through the trees to Mt Carrigain, and saw that the clouds were lifting and the sky was showing patches of blue. To me, it seemed that the steeper sections of the Pine Bend Brook Trail were rougher and even more precipitous than I remembered. 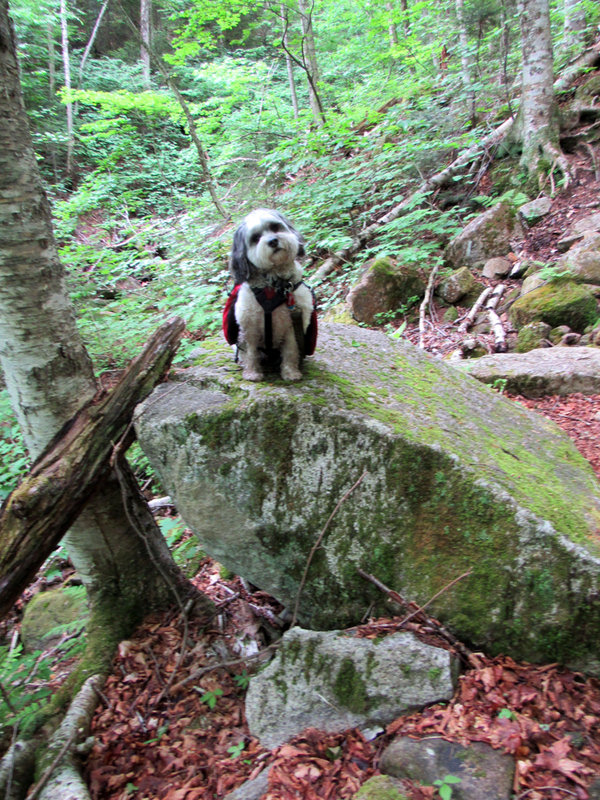 The last time I'd been this way was in 2005 with Muffin, nearly 13 years ago, and what stands out in my memory of that trip was not the long tedious climb but Muffin's backpack falling off while we were making our way over and between the rough boulders. Since she was in back of me, I didn't discoveri it until we made it to the top. "Why didn't you say something?!" I complained. Muffin just looked confused. Grumbling, I retreated back down the steep trail as Muffin followed behind. We ended up having to descend over 200 vertical feet to find the backpack. After I put it on her again and warned her to bark or whine to let me know if it happened again, we climbed back up to the top a second time. On this day, I made sure to check Patches fairly often so that the great backpack debacle did not strike again. Above this section, we reached a plateau and started making better time. 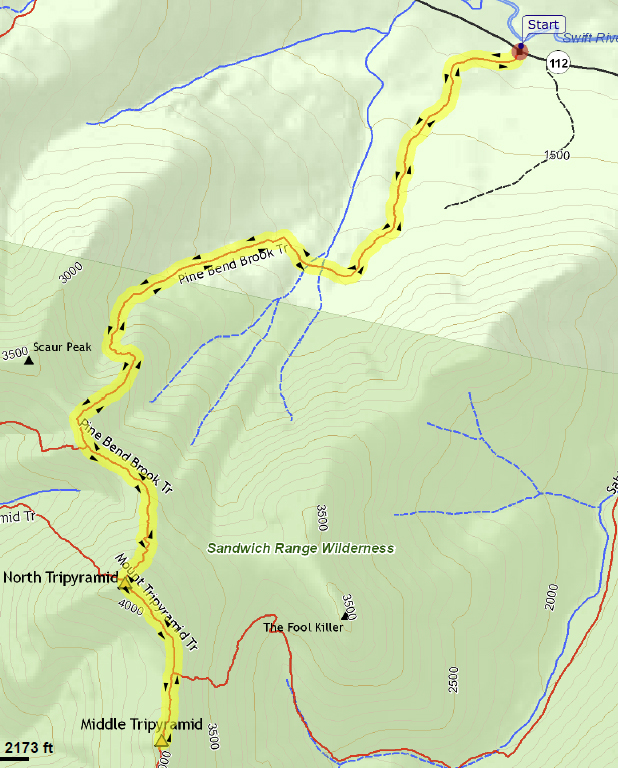 Soon, we arrived at the junction with the Scaur Ridge Trail, an alternative route to the North Slide for those coming from Waterville Valley via the Livermore and Mt Tripyramid Trails. Here, we stopped for a welcome and well-deserved rest. Patches ate some dog food, I had another power bar, and we both had a nice drink of water. Looking at the time, I saw that we were now about an hour over book time, which I didn't consider too bad considering that I had factored in an extra three hours over book time for the complete hike. Now it was time to make the final push to the summit of North Tripyramid up another steep and rocky section, climbing up, over, and often between large boulders. 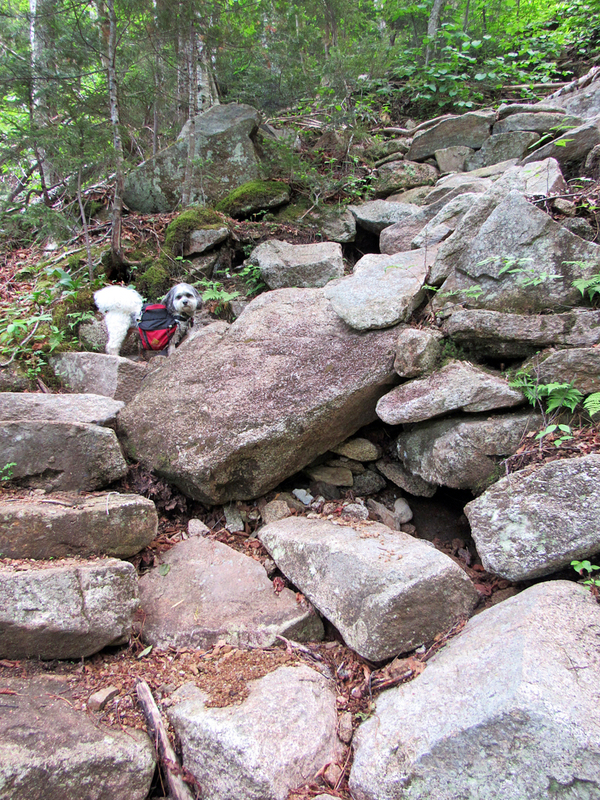 Patches did pretty good making her own way up this tumbled maze of granite, but I ocassionally had to show her the best way up, and once or twice I lifted her up a particularly precipitous ledge. Finally, aftter merging with the Mt Tripyramid Trail coming off the North Slide, we emerged victoriously out onto the summit plateau, both of our backpacks still attached to our backs. 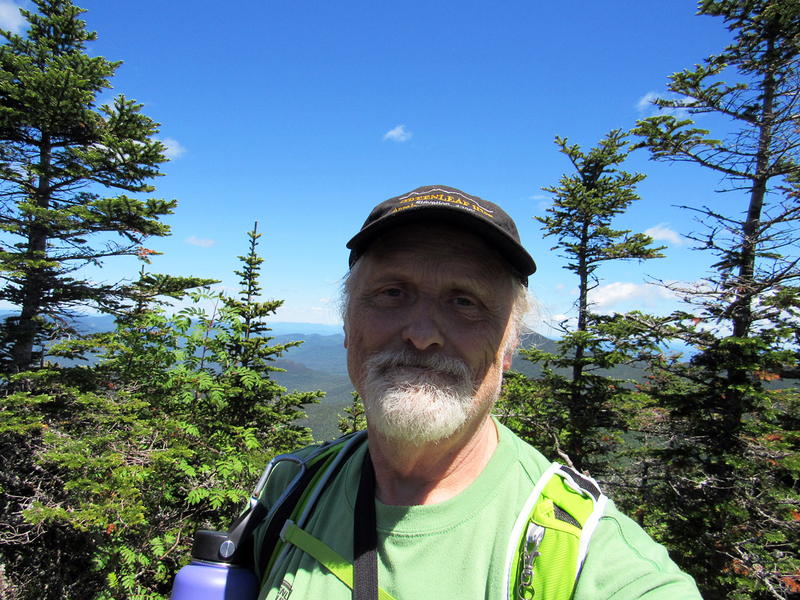 I took Patches' picture on top of some rocks at the high point, and then we headed down a short side path to where there were some restricted views to the northeast, including a glimpse of Mt Washington. After another short rest and snack, we continued south toward Middle Tripyramid, passing the Sabbaday Brook Trail in the col between the peaks. At Middle Tripyramid, there were two viewpoints: one to the west that overlooked Mt Tecumseh and Waterville Valley, and the other to the southeast toward Mt Passaconaway, the peak that we had climbed less than a month earlier, and where we then sat contemplating the very spot in which we were now standing. The trip back entailed climbing North Tripyramid again, but it wasn't too bad of a climb even though I was getting tired. We did have to make our way slowly and carefully descending the steep and rough sections of the trail, but once we got down a bit lower, we made good time the rest of the way back to the car. 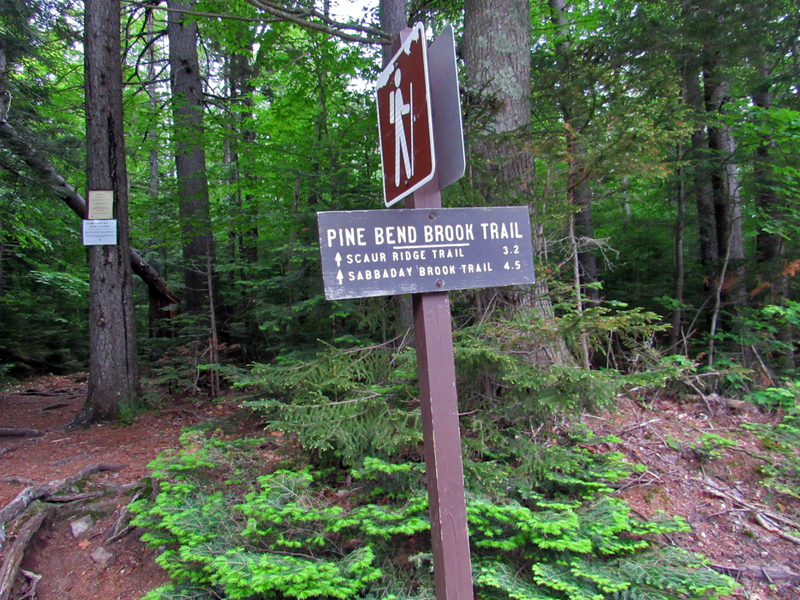 Pine Bend Brook Trailhead. There's no parking lot at this trailhead. You just have to park along the sides of the Kancamagus Highway. 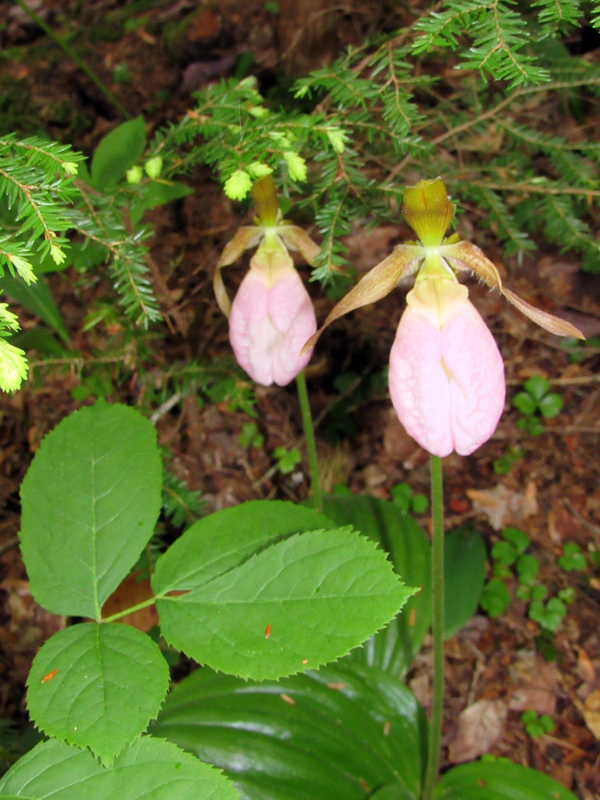 Lady's Slippers. It was still drizzling a bit and was cloudy and dark when I took this picture, so I had to use my flash, which unfortunately, washed out some of the pink color. 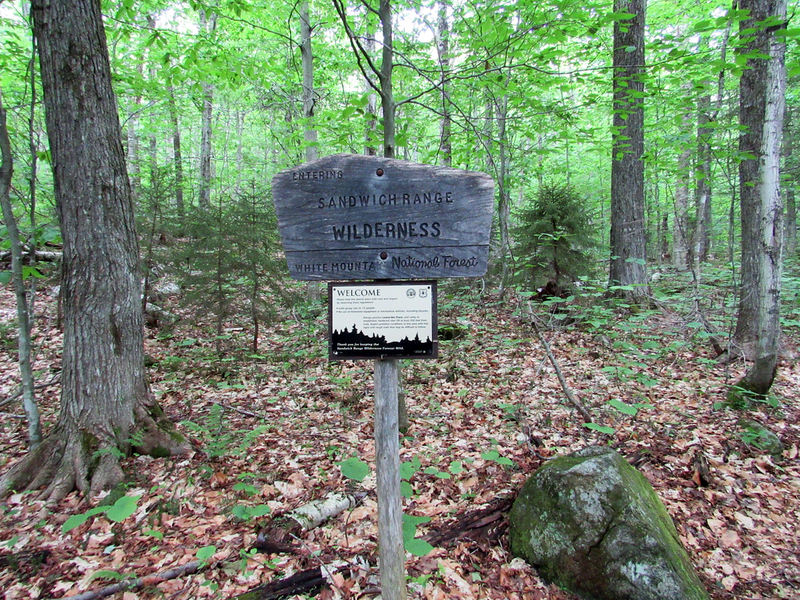 Sandwich Range Wilderness sign. The trail enters the wilderness about 2 miles from the road. 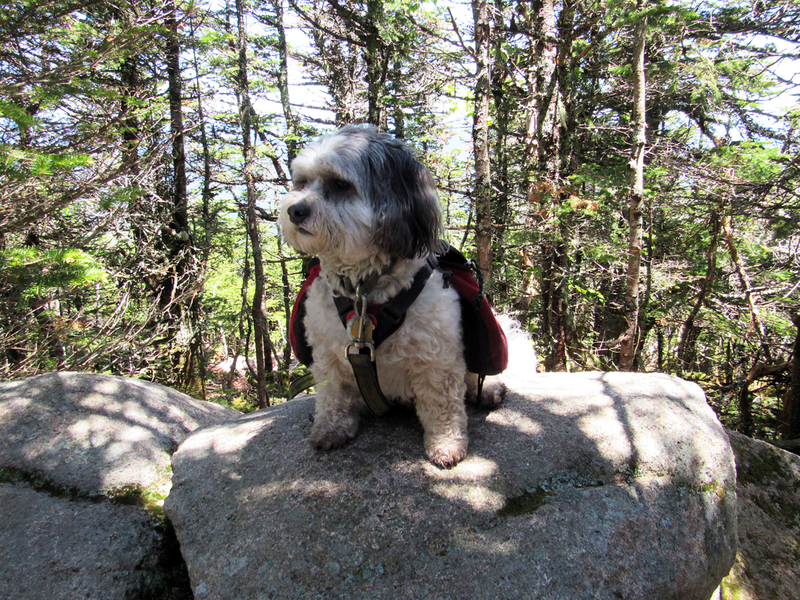 Patches enjoying the view from a boulder along the trail. She always seems to pick out the highest spots. At home, they're places like the raised footrest of a reclliner or the armrest of a couch. We call them her perches. 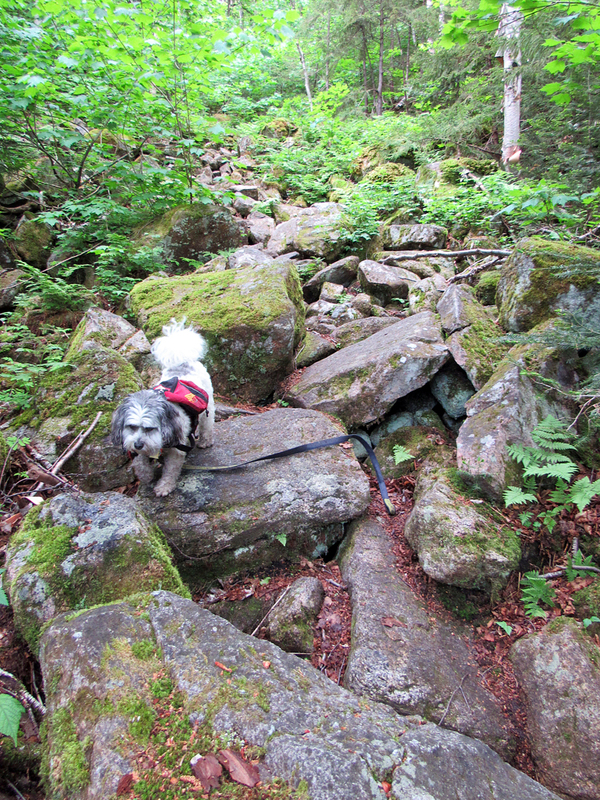 Patches making her way up a rocky section of the Pine Bend Brook Trail, which starts to get rougher and steeper after beyond the wilderness sign. Patches starting up a steeper section of the trail made easier by a few nicely-paced rock steps. Mt Carrigain through the trees. As we climbed higher, there were ocassional glimpses of distant peaks. Scaur Ridge Trail junction. 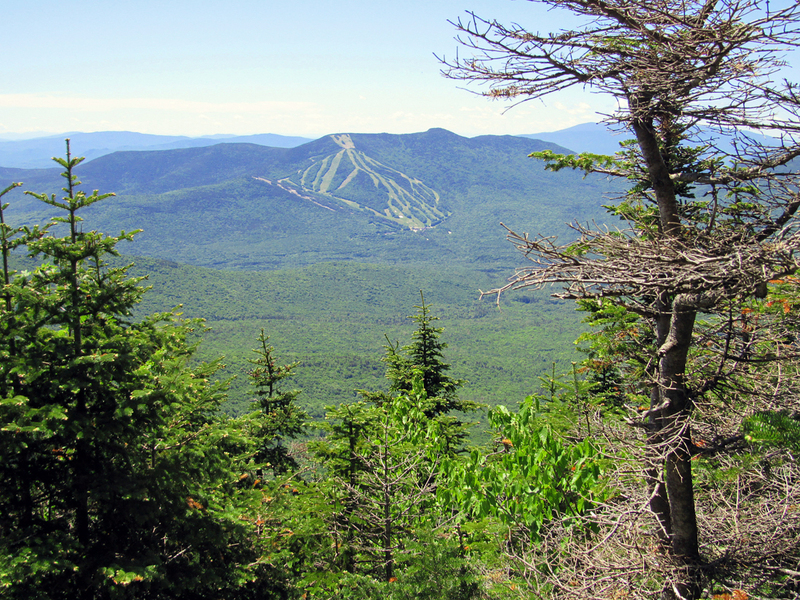 This trail is an alternative to the steep and dangerous-when-wet North Slide for thoss coming from Waterville Valley. Patches on North Tripyramid. 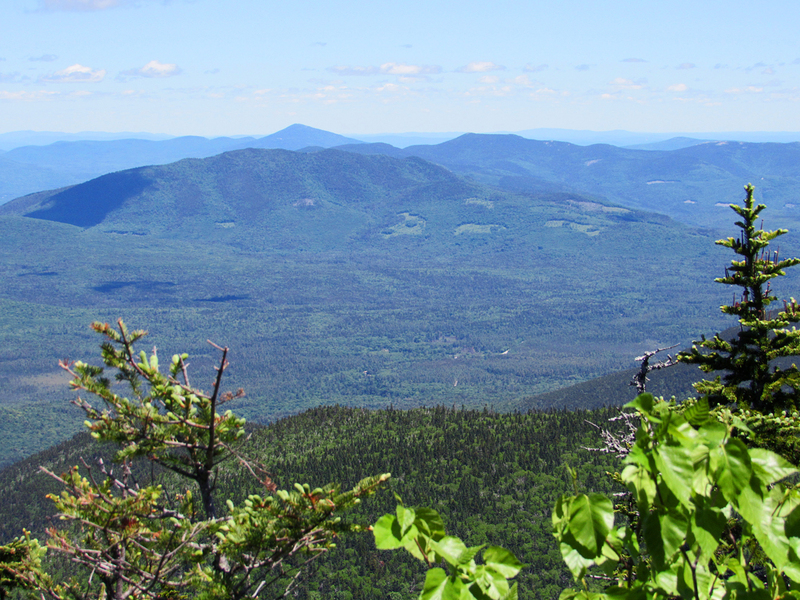 Although there's not much to see from the actual summit, there are some view to the northeast down a side trail. Looking northeast from the viewpoint on North Tripyramid. I'm not sure what mountains these are. Distant Mt Washington from the northeas viewipoint on North Tripyramid. 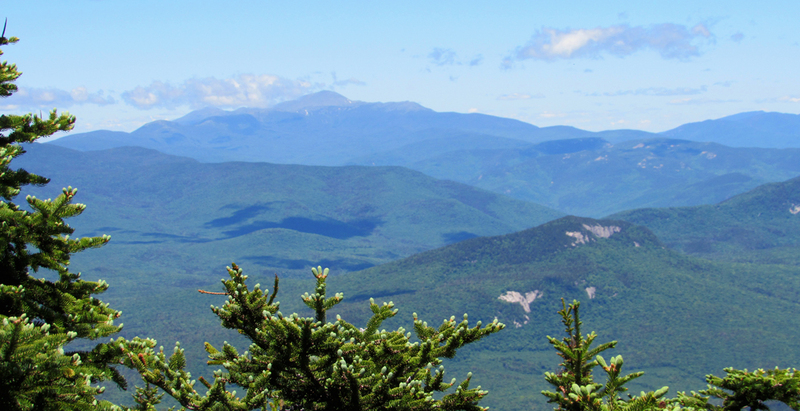 Closeup of Mt Washington, the Southern Presidentials, and the peaks along the Davis Path..
Patches on the west-facing viewpoint on Middle Tripyramid with the Waterville Valley Ski Area behind her in the distance. 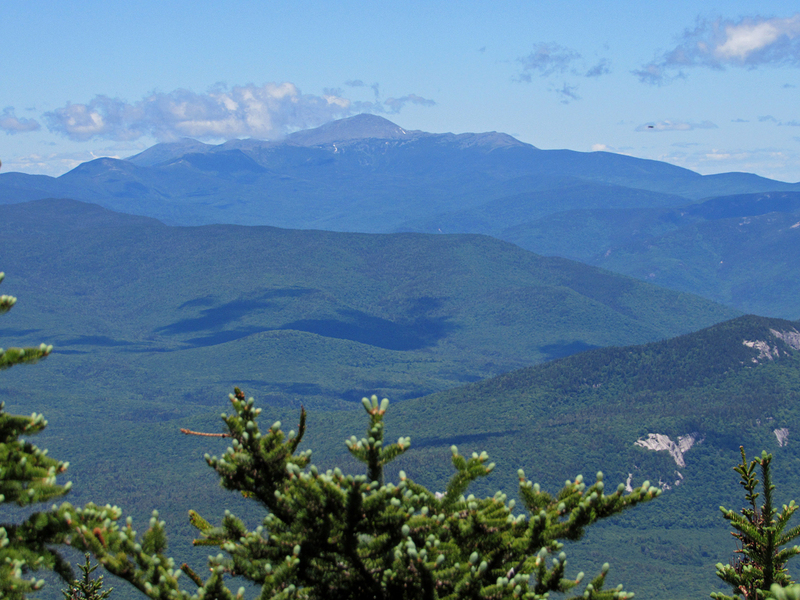 Closer view of Waterville Valley and Mt Tecumseh from Middle Tripyramid. 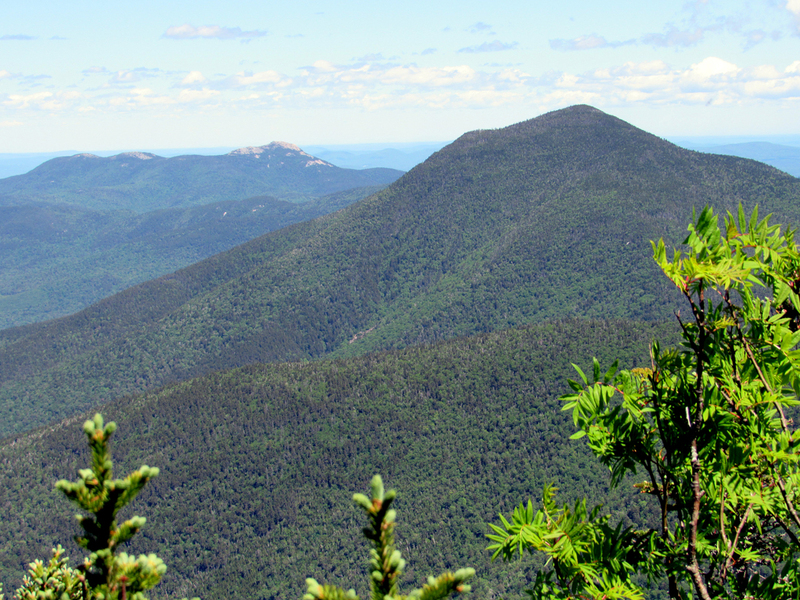 Mt Passaconaway (right) and Mt Chocorua from the southeast-facing viewpoint on Middle Tripyramid. We had just climbed Passaconaway 3 weeks ago looking out at the Tripyramids. Self-portait on the southeast-facing viewpoint on Middle Tripyramid.